Is it still possible to get a small business loan in the UK? In the aftermath of Brexit we are constantly being assured that Britain is still open for business. The soundbite has been used by Sadiq Khan about London’s ongoing strategic role, Philip Hammond on his first trip to New York’s Wall Street as finance minister, and most recently by Transport Secretary, Chris Grayling, in wake of the decision about Heathrow’s third runway. But how are things in reality for those running their own businesses and perhaps making use of small business loans in the UK? Is Britain really still open for business? Two recent pieces of research show that whilst Britain is still very much open for business, one of the issues that is causing increasing concern is time spent on business administration. This is particularly affecting businesses in their early stages. In February the FSB (Federation of Small Businesses) surveyed 1,685 small business owners online. The research by found that 67% of small businesses feel that time spent on business administration is preventing them from focusing on their business’ primary purpose: 55% of small business owners even think that their company’s growth is being held back by this. 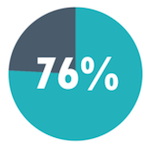 The FSB findings also found that 76% of small business owners spend more time than they would like on business compliance issues - including tax, employment law issues, insurance, pensions, accounting tasks, health and safety issues. The average small business owner spends over 33 hours every month on these kind of issues – around a quarter of their working hours - and it also ties up around 70 hours of employee time. The Tide research found that 63% of entrepreneurs spend at least one day every month on business administration. Interestingly they also found that many of these entrepreneurs feel unsupported by their banks: 36% rated the help and support from their bank during setting up their business as either Poor or Very Poor, and this dissatisfaction increased to 47% once they became established customers. This lack of support also has consequences in terms of repeat business: 67% of the Tide respondents said that they are unlikely to recommend their current business bank to others. Which should be a wake up call for banks as the long term value of treating their customers with respect and support! Interestingly, these areas can be broken down further depending on how long the business has been established. Companies that are less than a year old are more likely to struggle with tax and accounting: 60% and 59% respectively as compared to the averages 54% and 51% shown above. However, companies that have been established for longer are more challenged by responsibilities such as keeping track of expenses (55%) and payroll (27%). 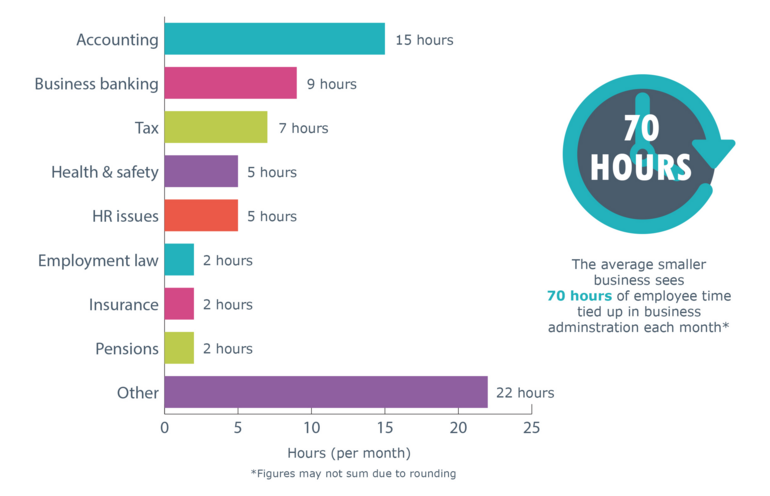 Either way, if we group the last four of the issues on the Tide list under the “Accounting” umbrella, FSB also found these areas to take up most employee time - see image below. The government has previously pledged to make things easier for small businesses in the UK, including its Cutting Red Tape initiative which aims to highlight on the red tape and bureaucracy that affects individual sectors and businesses within them. But things like this take time and businesses need help now! 46% of respondents to the FSB survey said they would hire external experts to help them with business administration if they could afford to - but the average small business that does outsource these services spends almost £14,000 a year doing so. As a starting point there is a great deal of helpful advice - and related tools - on the gov.uk website. This includes specific sections for setting up a business, business tax and business finance and support. You will also find that some alternative lenders - such as Fair Business Loans - will not only provide a small business loan to UK businesses but can also be a valuable source of help and support with issues such as taxation and business accounting. Choose your financial support wisely and you may find that they are much more forthcoming than the banks cited in the Tide research! Coming back to our opening question - whether Britain is still open for business - it would seem that the answer is a resounding yes! But the support infrastructure needs to be much improved to ensure that vulnerable new businesses do not become trapped in the endless hoops through which they need to jump simply to be allowed to exist.